So I'm lucky enough to be jetting off to NYC in early July with my Mum and Sister and I am so bloody excited. I've started thinking about what outfits I'm going to wear and what I need to pack so I thought why not share with you what I'm taking in my carry on bag. Before I do anything, the very first thing I do is write a list of everything I think I will need in my hand luggage. Once I've written a list I choose the bag and then I start to pack everything into it. If things don't fit then this is where I become brutal but to be honest I always choose a fairly large bag so I don't have to worry about that! For my hand luggage I like to take a rather big handbag so I can fit all my essentials in it an ensure I'm occupied during the long flight. 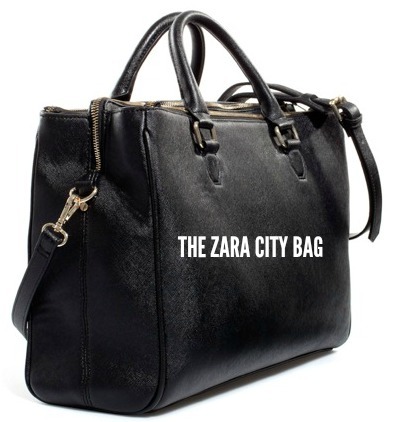 For this trip I've decided to take my trustee Zara city handbag. It's great as it's got lots of different compartments and they are secure too. I don't want to overload the bag with anything unnecessary but I like to cram everything in at the same time! I never like to pack tonnes of things in my hand luggage as I always opt for a handbag rather than a case if I'm going on long haul flights. I like to pack the essentials to keep me occupied for the 6-8 hour journey and a few extra skincare items to give myself a little in flight pamper. Firstly, the biggest essential for me during a long haul journey is my headphones. My headphones of choice are this rose gold pair from Primark for around £10. My boyfriend bought them for me for my Birthday back in February and I love them. They're really good because they cancel out any background noise (essential for a long flight with the potential of having screaming babies on it!) They're also rose gold so they're basically my aesthetic. Of course I can't travel without my IPhone 6. I don't use my phone much on flights because I don't want to waste the battery but I like to use it to take photos on. My IPhone case is from HM. For long haul flights it's essential for me to have access to my ipad or laptop. I know I won't have much time to use my laptop whilst I am out in New York so I've opted for my I Pad Mini this time. I bought this amazing case from Ebay which has a built in Keyboard so it's basically a mini laptop which is so cool. I can draft some blog posts during the flight and write down any notes I have too. You cannot go anywhere without chargers to charge up all your electrical items. I've packed my Iphone Charger with my long wire (which is great if the plug in the hotel room is far away from my bed). I also packed my portable Iphone charger too for the plane in case my phone or I Pad runs out of charge. These are a godsend and I am almost certain I got mine from Primark for less than £10. Bargain or what!? I won't make it to New York if I forget my passport so obviously this has been packed in my bag. I've also go this really cute passport cover from primark for under £5.00. It's rose gold again and says "let the adventures begin". I also have my purse packed with all my dollars! I love this black purse that my Nanna bought me for my birthday. It's the perfect size for me and fits all my cards in too. I love it. I never travel without a Notebook and Pen. I love making notes, I'm a list person and so is my mum so this flight is going to be fun! I like to note down my blog post ides, lists of things to do, I'll definitely be jotting down the sights to see in NYC. My mum and I will probably make our itinerary whilst on the flight too. Ahh I'm getting so excited just thinking about it! I can't go anywhere without water, it's so important to feel hydrated - especially on a long haul flight. A good tip is to take an empty water bottle and fill it up once you get through security. You will save money instead of buying a bottle in duty free for over £2!! I also like to pack some chewing gum in my carry on. My favourite is the Wriggly's (green pack) and I usually have one before I get off the plane to make my mouth feel a little bit fresh until I can brush my teeth properly when I arrive at the hotel. I like to pack a pair of cozy socks for long haul flights because I always get cold and there is also nothing better than a good pair of fluffy socks to make you feel at home! For makeup and skincare I like to take a few items to help my skin during the flight. I usually always travel with no makeup on so my skin can breathe but sometimes the air con on flights can irritate the skin. To avoid this, I like to take a moisturiser and some lip balm on my flight. I use the Nivea day cream which feels really hydrating on the skin paired with my Elizabeth Arden 8 Hour Cream which is the bomb. I also take a mini roll on deodorant and perfume so I can freshen up when I arrive too. Make up wise, I keep it minimal, I take a light foundation, my brow pencil, some mascara and a little bit of contour. I also take a small hand sanitizer as planes are disgustingly gross and if I'm going to be doing a mini skincare routine on board I need to make sure my hands feel clean. Remember due to the airline regulations you can only bring liquids that are 100 ml, and the clear bag can only total 1 litre. What do you pack in your carry on? Am I missing anything essential?